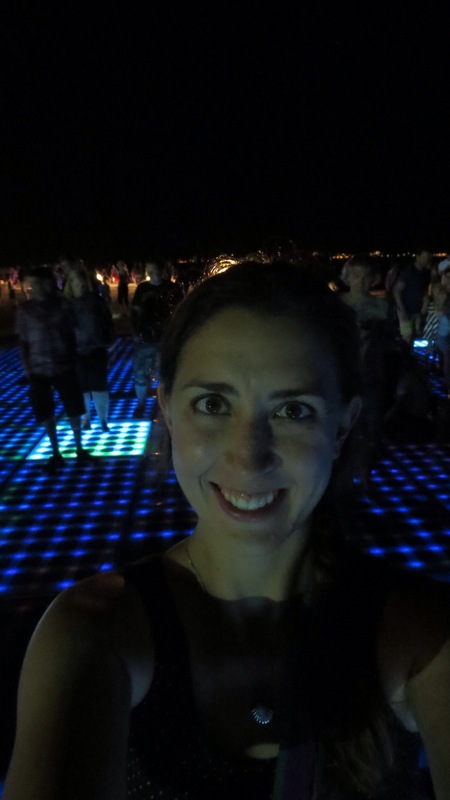 Just a friendly update from your favorite technologically-impaired travel blogger, whose recent online silence has sparked several concerned emails regarding her whereabouts and cardiac status. Yes, I am alive, and currently in Vang Vieng, Laos. Since leaving Chiang Mai, Thailand last Monday, I have officially entered The Rest of Southeast Asia, otherwise known as Slow Wifi Land. Any attempts that I have made in the last week and a half to update my blog and upload photos have been met with imaginary derisive laughter from my iPad. “Silly rabbit! Pics are for kids!” Not that I am complaining. It just means that I am now about two months behind in my travel updates. I have this funny feeling that many of my future posts will be completed in snowy post-Christmas Cleveland. – purchased and wore not one, but two pairs of baggy elephant-print pants. 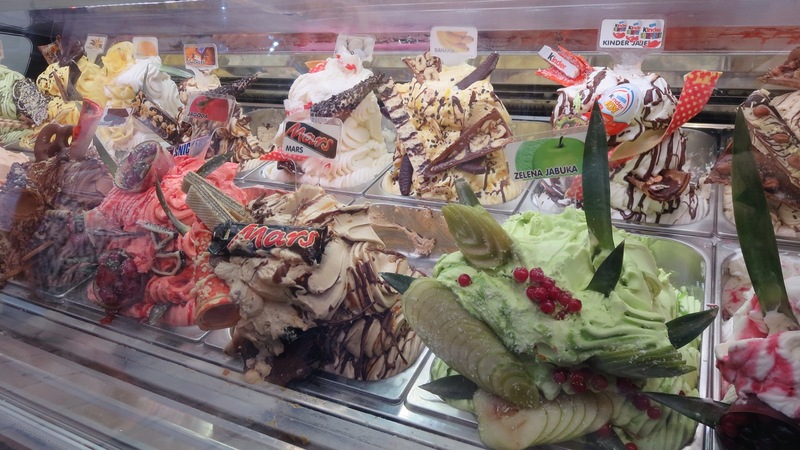 Hey, when in Rome, right? I may look like a hippie farang, but man, are these pants comfortable! Upcoming plans are to head to Vientiane, the capital, this weekend, get my Myanmar visa, then take an overnight train to Bangkok next week. From there, I will fly to Mandalay in Myanmar and spend the next 2-3 weeks exploring one of the least explored countries in Southeast Asia. Can’t wait! Photos and posts… well, they will happen when they happen. Off to eat some pumpkin soup to remind myself in this humid, tropical weather that yes, it is October! Contrary to what my lack of recent posts might suggest, I am not being held captive somewhere on the Dalmatian coastline. 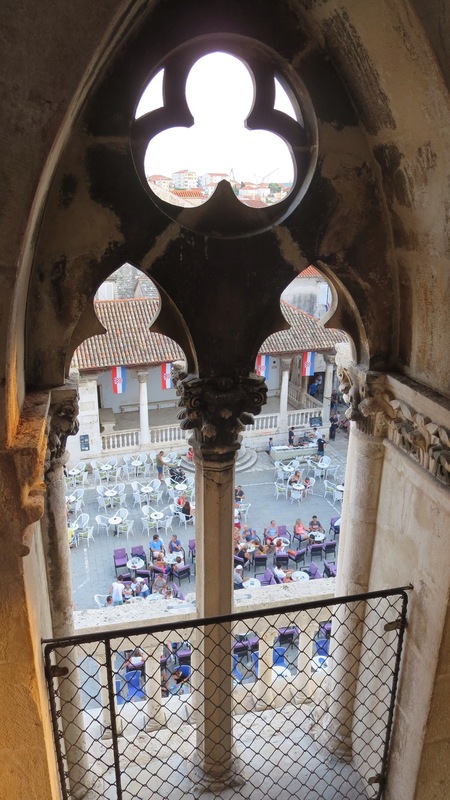 The month of August was spent traveling through the Balkans, of which I set foot in every country except for Serbia, which was a bit too far north to work into my travel schedule. 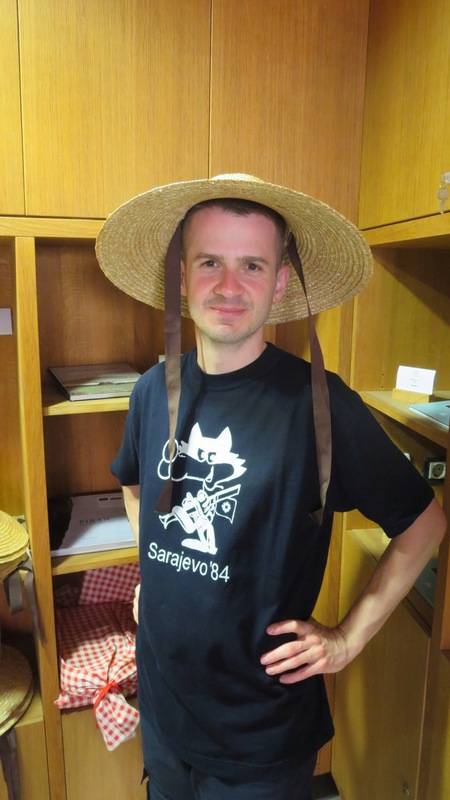 On September 1, I began the Asia leg of my journey. While China was a fascinating place to visit, the extremely hectic schedule of our tour and the unreliability of the internet there (I never realized just how much I use Google!) were not conducive to writing blog posts. 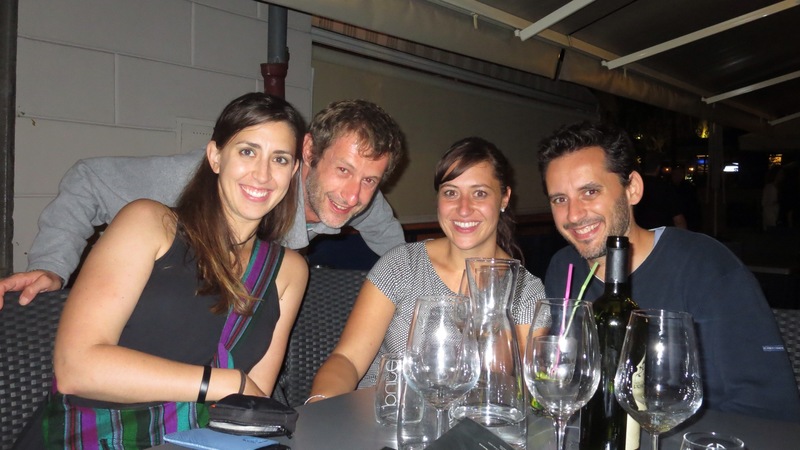 While in Shanghai and then Shenzhen, it was much more fun to hang out with old friends again than to update my website. I battled a nasty cold for my first few days in Kowloon (Hong Kong) , then decided over the following days that Hong Kong has made the list of my Favorite. Cities. EVER. 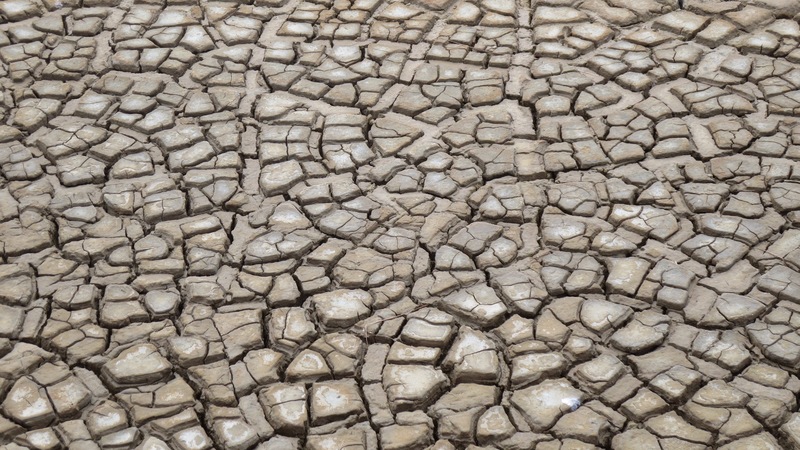 Who wants to work on a website when you’re exploring the coolest place on Earth? 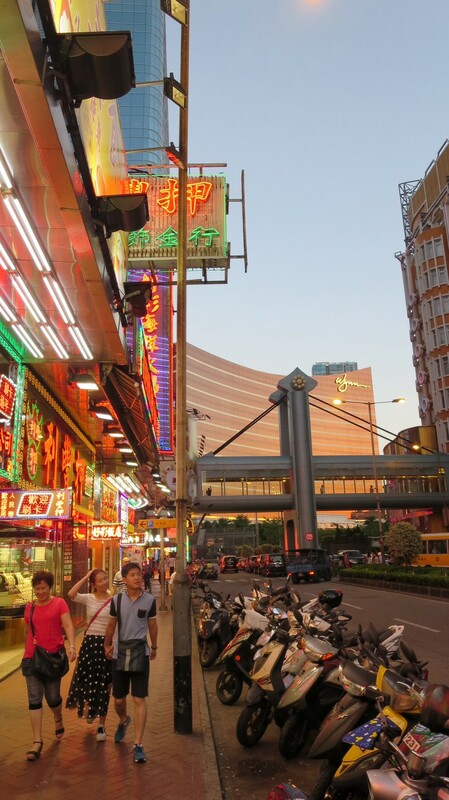 I’m currently in Macau for the weekend and will be heading to Thailand on Monday. After almost two months of moving at what now feels like warp speed, I have no set plans. The slower tempo will be good for settling back into somewhat of a normal routine, outlining an itinerary for the rest of the trip, and doing some major updating on the website. In addition to writing about all of these lovely places and people I’ve just mentioned, I’d like to do some cleanup of the site to make it more organized. I can’t believe that I have written over 75 posts so far! OK, back to fantasizing about being in a 007 movie. Macau was featured in the last James Bond flick, and I would be lying if I said that I didn’t listen to Adele’s “Skyfall” on repeat for about 2/3 of the ferry ride here. I never said I wasn’t a nerd ;). 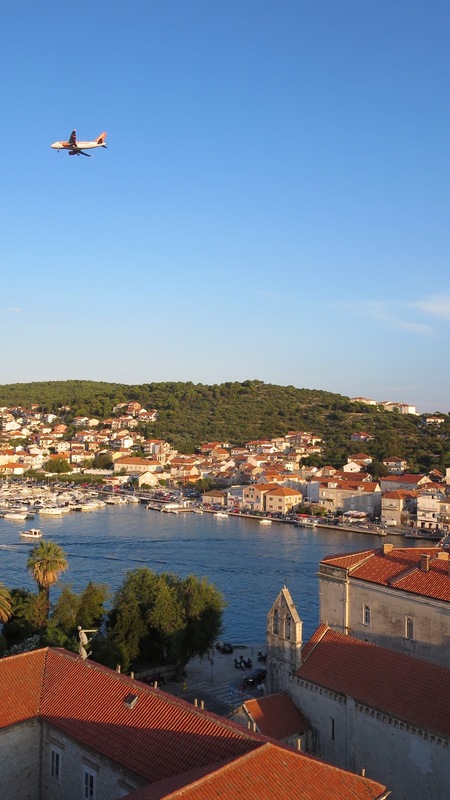 I was disappointed to miss Trogir the last time I visited Croatia. 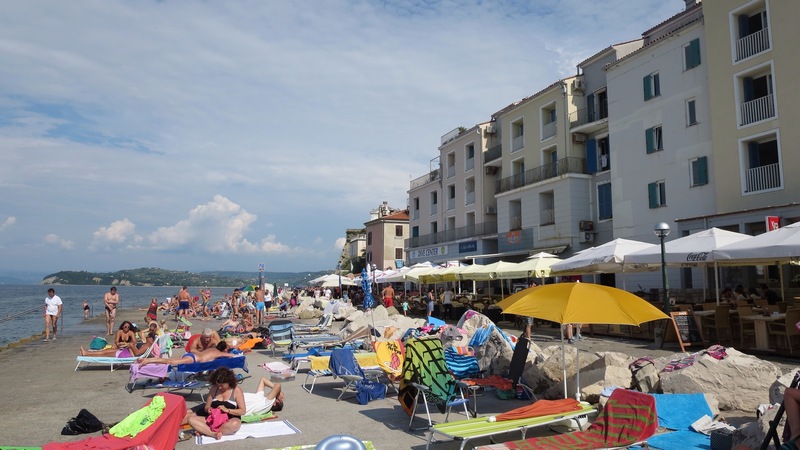 Less than an hour by car from its much bigger neighbor Split, this tiny stari grad-on-an-island can often get bypassed. 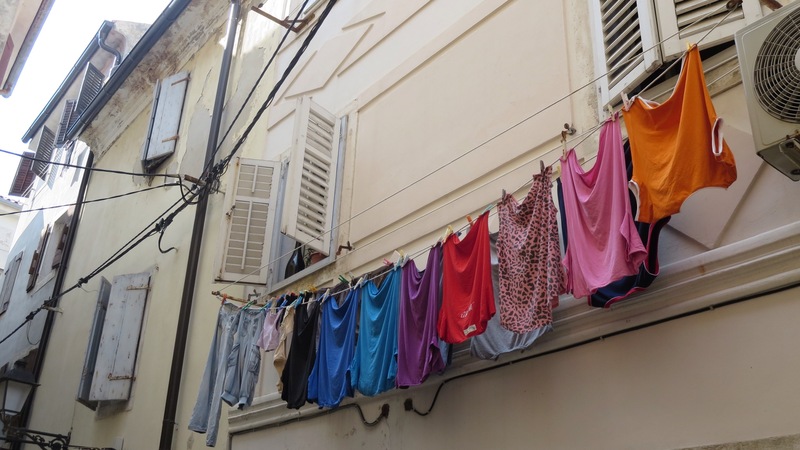 I was looking forward to my visit and had booked what looked like a great deal on TripAdvisor: a room with a private bath and kitchenette just over the bridge from the old town on the mainland. Three nights for a good price. Perfect. [Side note: every time I entered “Trog-” in an online search, I would automatically want to complete the word with “-dor.” And then I would get the Trogdor song stuck in my head for the next hour. 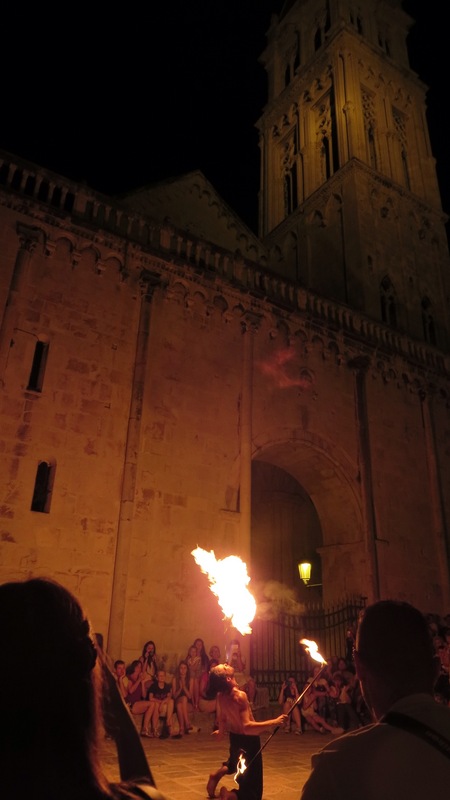 Which doesn’t even make sense: Trogir is a town in Croatia, while Trogdor is… the Burninator. No embedded YouTube link available at this time: you’ll have to look it up if it sounds intriguing to you. Thanks, Chinese internet censors!]. I could write a very long-winded and detailed rant about the accommodation disaster that followed, but I will try to sum up briefly. The apartment was NOT in the location shown on the map in the TripAdisor ad, but instead in a different town on a hill that cost $18 in a cab to reach from the old town. ($36 round trip just to see the actual town you came to visit is not a deal!) When I arrived and remarked to the owner that although the place was beautiful, it was not in the advertised location, she became incredibly defensive, nasty, and unwilling to have any type of discussion about it with me, concluding with the sentence, “If you don’t like it, fine. I will call the taxi back, and you can go find someplace else to stay.” So I did. I refuse to deal with someone who is so unprofessional. Minutes later, I was walking with my backpack back down a winding hill to the shore and finally found a water taxi that could take me more cheaply to the old town. Within 24 hours, I found that my full payment had gone through as scheduled, and I am still embroiled in a back-and-forth with TripAdvisor that I have a strong suspicion is going to get me absolutely nowhere. Updates to follow. Every cloud has a silver lining: my new room was perfect! Once settled in, I was finally able to enjoy my stay in the town. I spent the mornings getting groceries at the market and writing on my iPad over coffee at the bar around the corner (which liked to play techno music at all hours, but who’s complaining?) 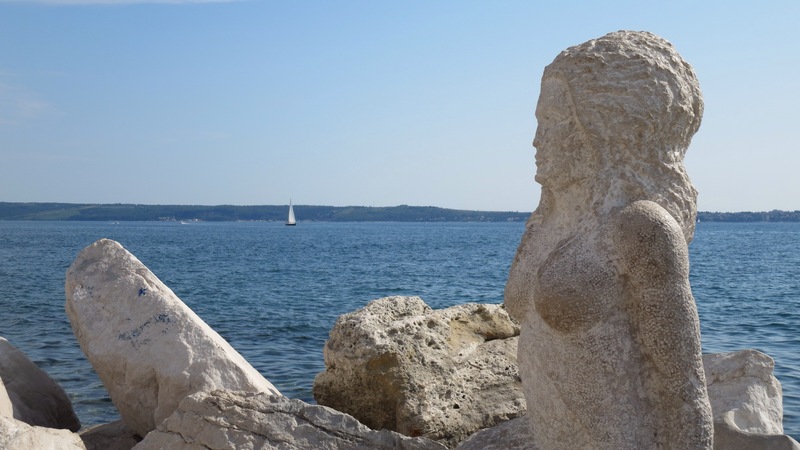 In the afternoons, I would slather on the sunscreen and head over to the pebbled beach of Okrug Gornji, skipping the lounge chair fee in favor of spreading out my towel for free directly on the stones in a less crowded area. 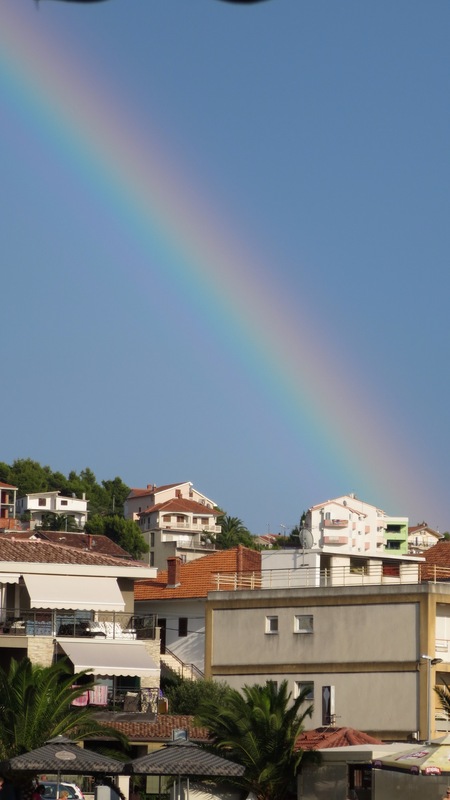 The only rain that I felt for the entire month of August in the Balkans fell in sporadic droplets from a sunny sky my second afternoon in Okrug Gornji; it was followed by a rainbow that made for some amazing photos. 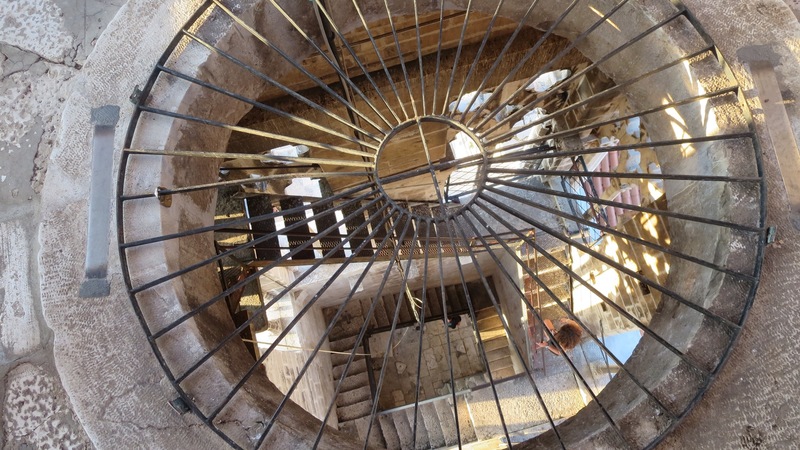 Back in town, I climbed the rickety steps of the belltower of the cathedral of Sv. 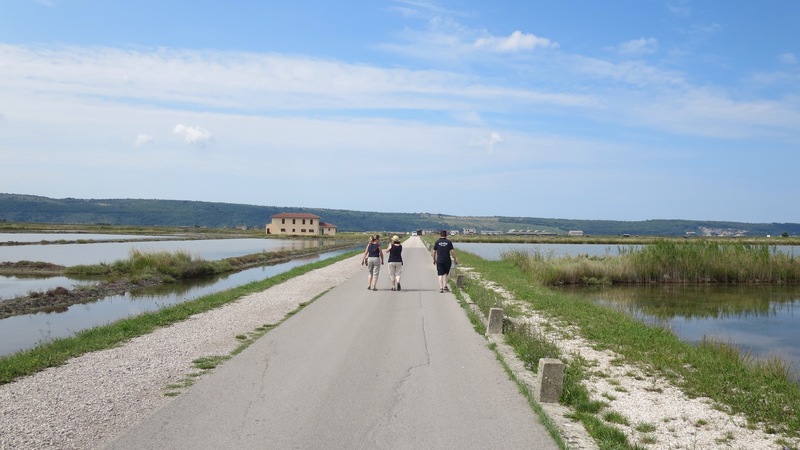 Lovro – not for the faint of heart, folks!- to get a fantastic panoramic view of the town and the surrounding coastline. In the evenings, I would wander around the Old Town, checking out the ridiculously posh yachts that had docked along the banks for the night. There were street musicians (including a house band that played an almost unrecognizable cover of “Me and Bobby McGee in a thick Croatian accent. Janis Joplin was turning in her grave that night), street performers (a puppeteer whose puppet reminded me of Franklin from Arrested Development) and vendors selling everything from necklaces to roasted corn. The smell of the corn was so enticing that it actually persuaded me to ditch my restaurant plans and just continue wandering, corn dinner in hand, for the rest of the night. 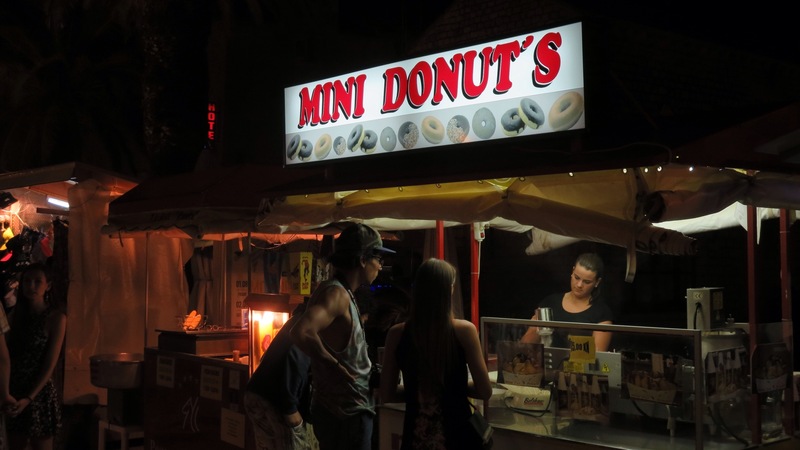 A mini donut’s what? Call the grammar police! 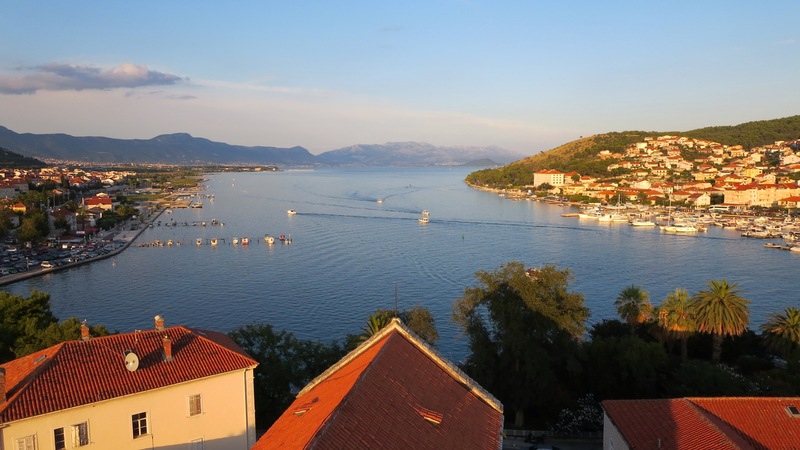 Lodging fiasco aside, Trogir was a beautiful, albeit crowded, place to visit. 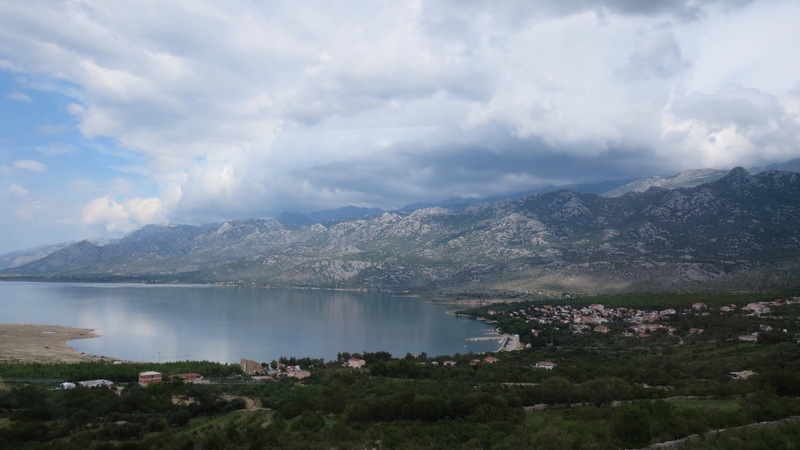 When I calculated how long it would take to get to my next stop, Kotor in Montenegro, by bus, my total time did not sound like it would make for a very fun day. Why not break up the trip by making another stop on the way? Time to head to Dubrovnik. On Friday morning, my mother and Majda dropped me off at the bus station. 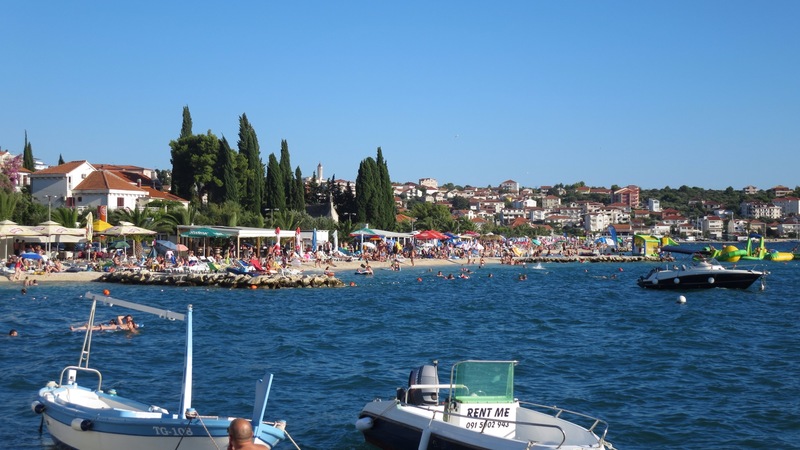 My plan was to spend the month of August inching my way down the Balkan Peninsula, heading back north and ending up in Bulgaria by the end of the month. My reasoning? Not only have I not visited most of these countries, but I needed to get out of the Schengen area. As a US citizen, I am only eligible to spend 90 out of every 180 days within the countries of the Schengen zone without getting a visa. I had entered France on May 9, which meant that I needed to be outta there by August 9. (Not sure what the consequences are for overstaying your welcome, but I wasn’t about to find out for myself!) 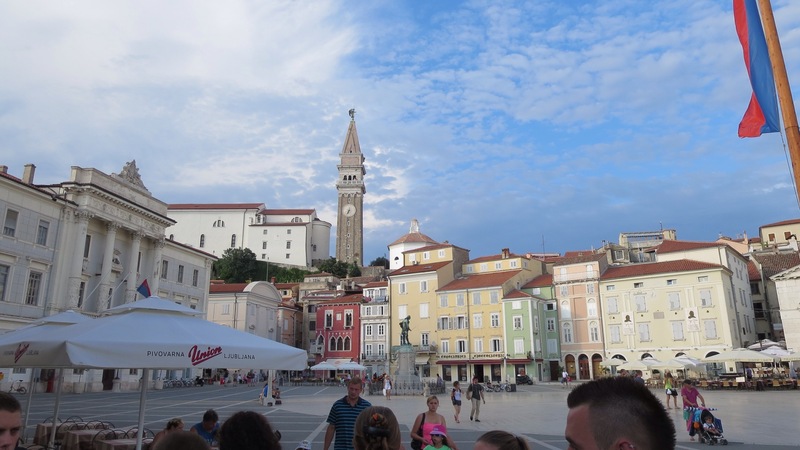 While Slovenia is a Schengen country, Croatia is not, so I decided to head there first, making up an itinerary as I went along. 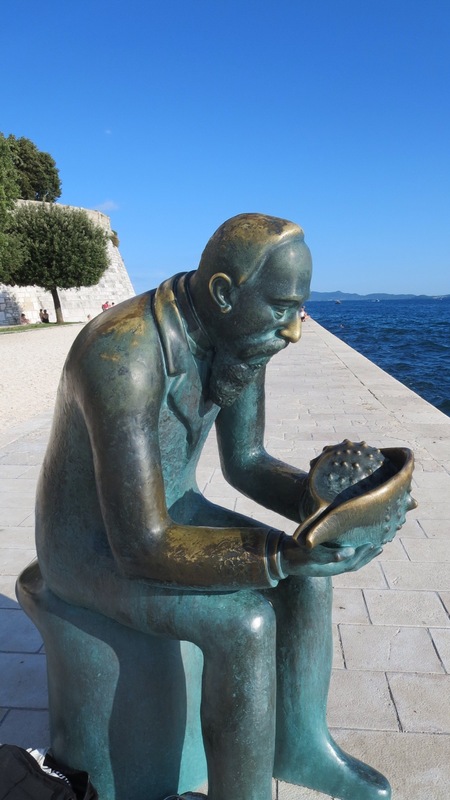 I had not originally planned to spend much time at all in Croatia, since I have visited several times before and really wanted to focus this month on seeing new places. 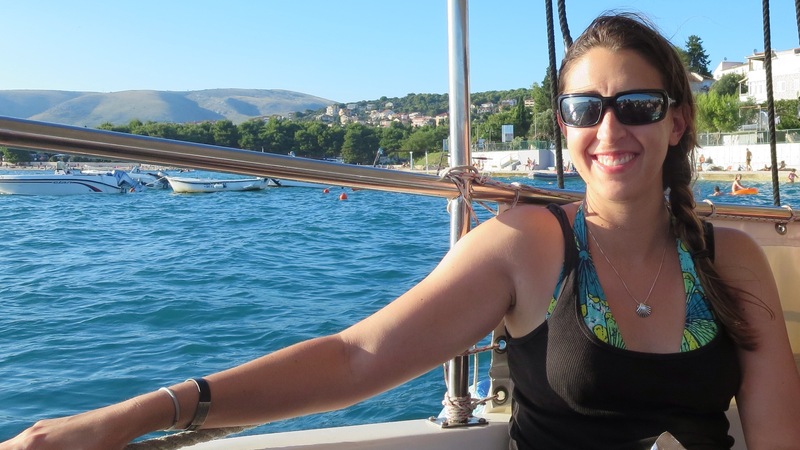 (Also, Croatia seems to be The Place To Go now. 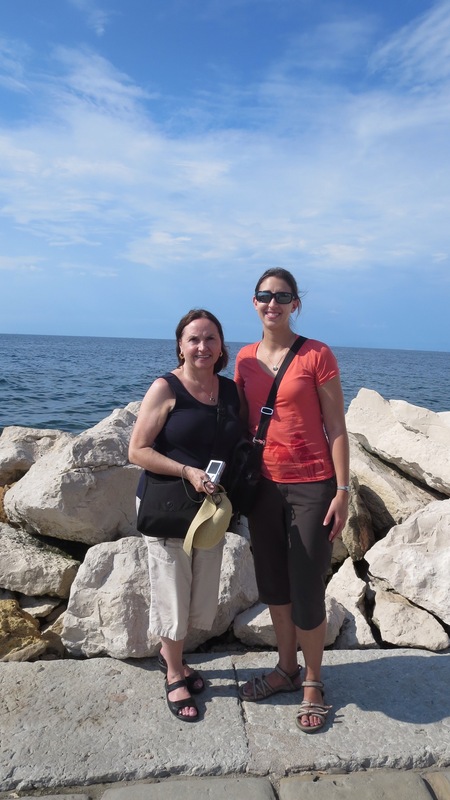 Not to sound all “been there, done that,” but since my family is Slovenian, Croatia had often been a natural extension of many trips we took back there. I was first in Croatia in 1994. 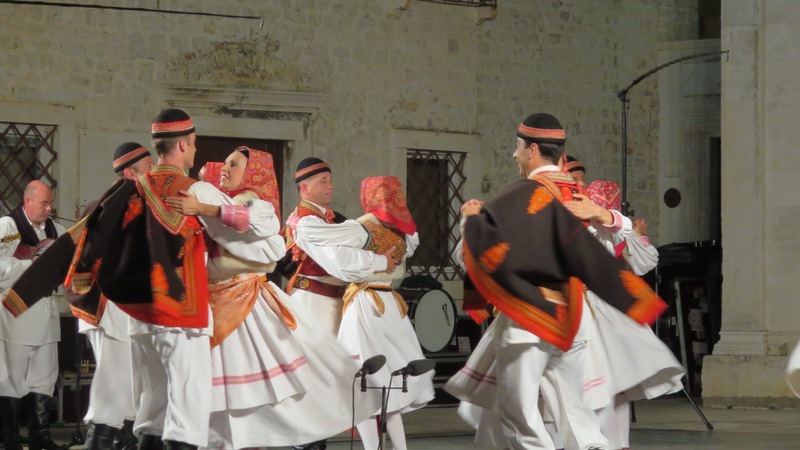 A typical reaction to mention of any Croatian travel plans back then went something like, “Oh! Wow. Where is that? 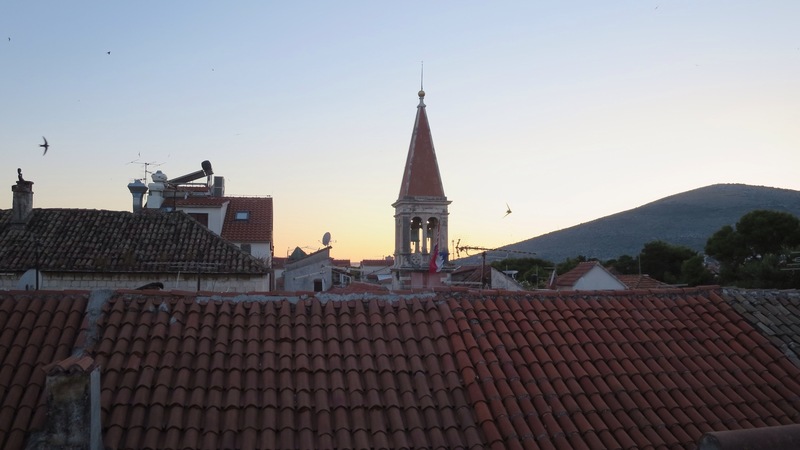 Wasn’t that in the news lately?” Now when you mention a trip to southeastern Europe, you hear, “Make sure you go to Dubrovnik! Have you heard of Dubrovnik?” So I just think the whole thing is really funny). My plans to bypass Croatia pretty much went up in smoke, however, when I perused a map: it is a really broadcountry. Unless I wanted to fly -which I didn’t- Croatia would be a necessary stop on my way southeast. 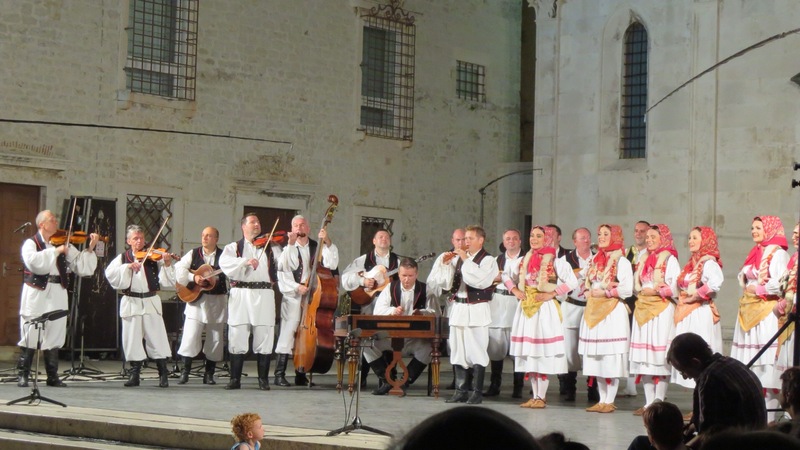 This Zakelj had to decide between going via Zagreb or Zadar. (So many Z’s! I feel so at home!) I opted then to stick to cities along the coast that I have never seen before. 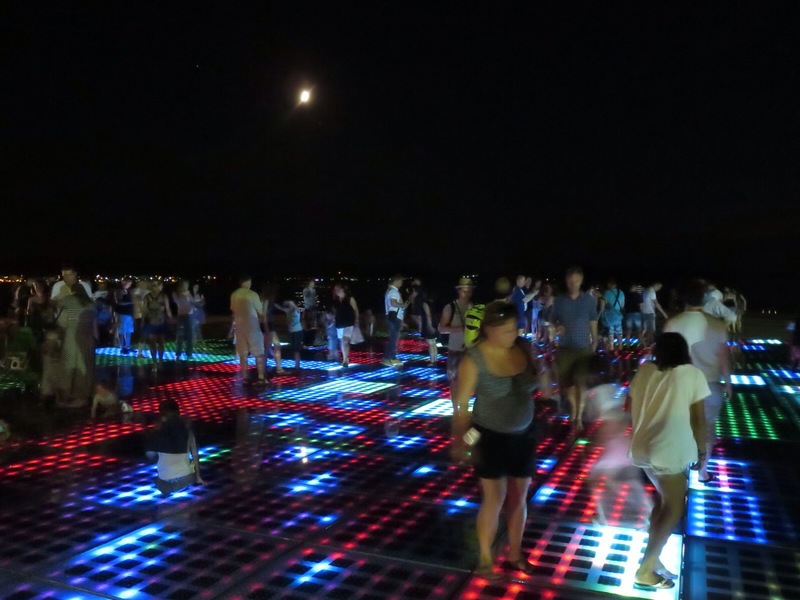 Zadar would be my first stop. 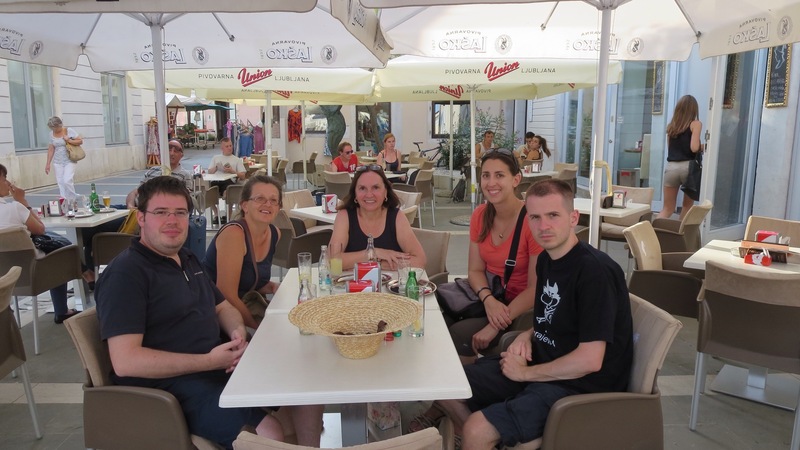 We arrived in Zadar, and I was picked up at the bus station by the owner of my rental apartment. She was incredibly sweet and offered me a glass of juice when we reached the place. Since there would be no other tenants that weekend, she allowed me to pick which bedroom I wanted. It was great: I had an entire place to myself! I took a short walk and bought some groceries. One thing I was looking forward to was cooking a bit for myself. Sometimes when I travel alone, I just crave a bowl of cereal for breakfast. 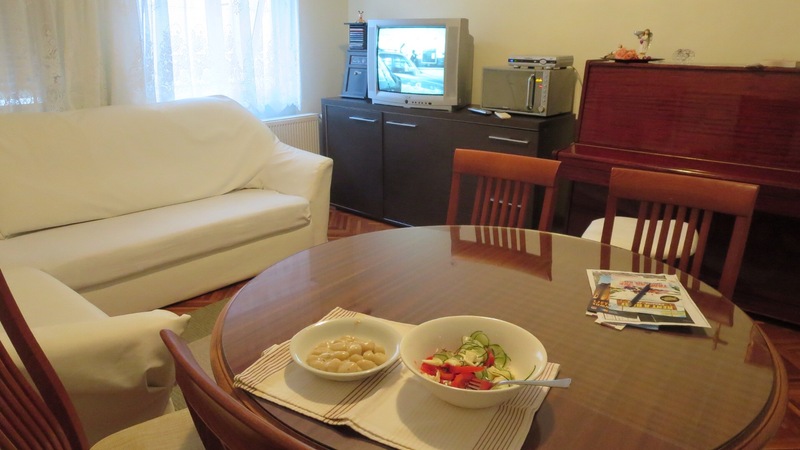 That first evening, I was so tired that I ended up staying in: it was fun just to cook dinner and watch music videos in the apartment. The next two days, I got to explore the town a bit (which included getting lost on my run while trying to find the bus station). 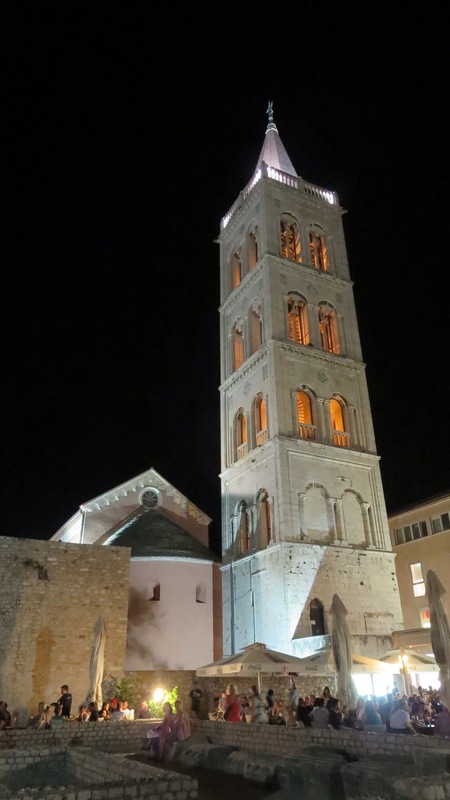 Zadar does not have quite the same level of tourism as say, Split, so it was pleasantly busy without being too crowded with people. 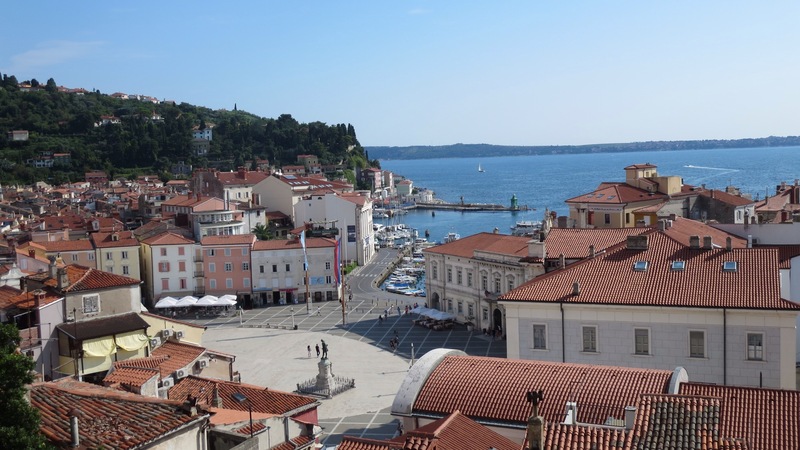 The Old Town’s major attractions -other than the city walls and the old town itself – are the Sea Organ and the Sun Salutation. The Sea Organ is built beneath the steps of the waterside promenade: as the waves wash under the steps, the movement of the water plays the organ and creates a calm, whistling melody. (No video right now as I am still having WordPress video issues. I apologize!) 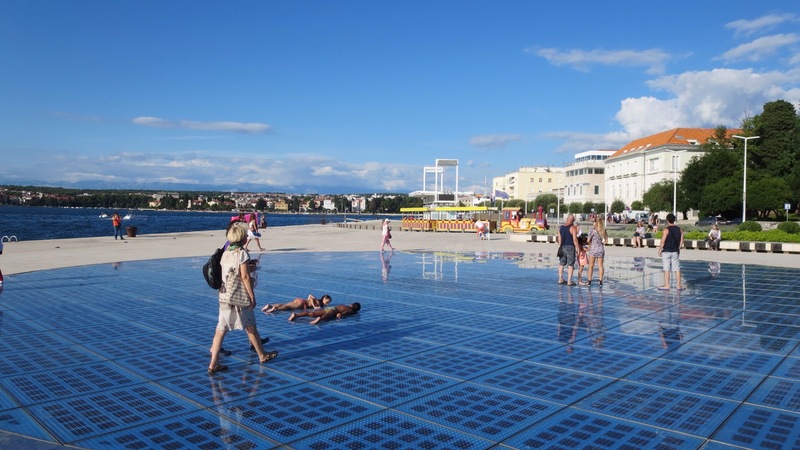 The accompanying Sun Salutation is a large circular set of photovoltaic cells embedded in the cement of the promenade. Using the solar energy harvested during the day, the cells turn on series of colored LED lights whose patterns are determined again by the underlying waves. The combination of the two makes for fun people-watching during the evenings. 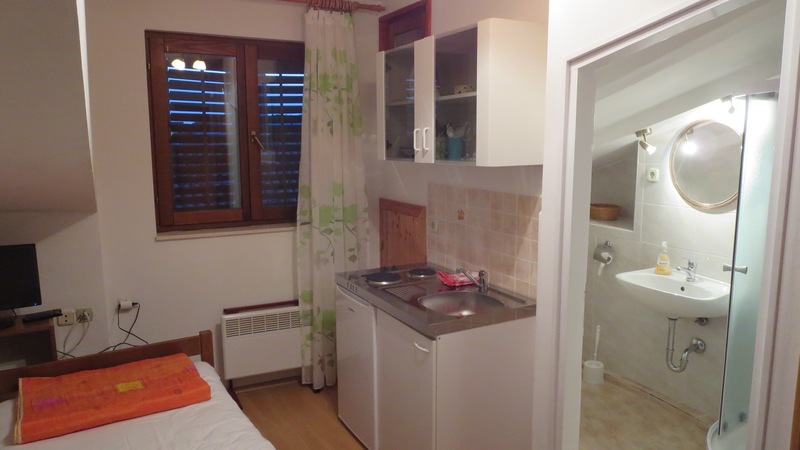 I had a good experience booking my apartment in Zadar. 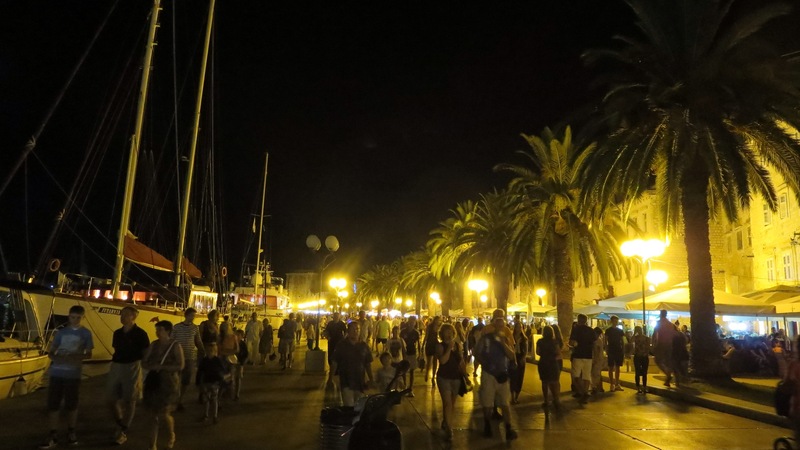 Little did I know what a fiasco would occur when I arrived at my next destination, Trogir. 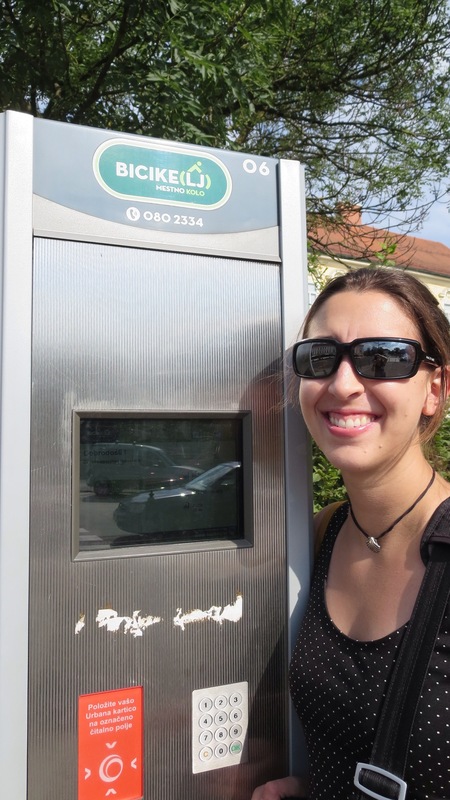 This is the name of the bike-share system in Ljubljana. The name is clever because it’s a blurring of the English word “bicycle” and the first two letters in Ljubljana. I also like it because it kinda looks like the letters of my name squished together :). 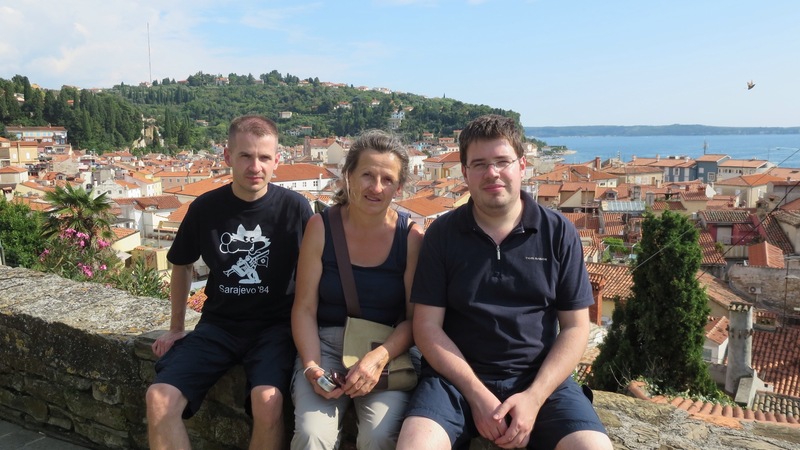 My mother and I went with her cousin Anka and her two sons, Miha and Grega (whose name my iPad just tried to autocorrect into Gregarious. Funny!) 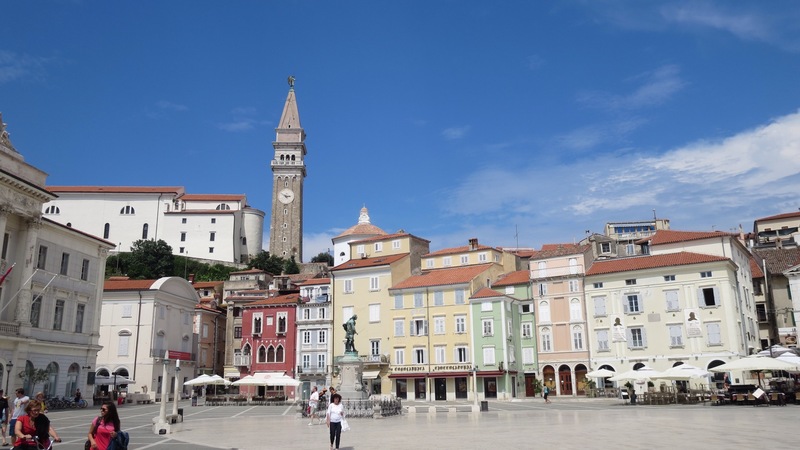 on an izlet, or day trip, to Piran, a beautiful town on Slovenia’s relatively tiny stretch of coastline on the Adriatic. The weather was a vast departure from the dreary rain that Ljubljana had gotten for the previous several weeks, and we were rewarded (or not) to a hot, sunny day. 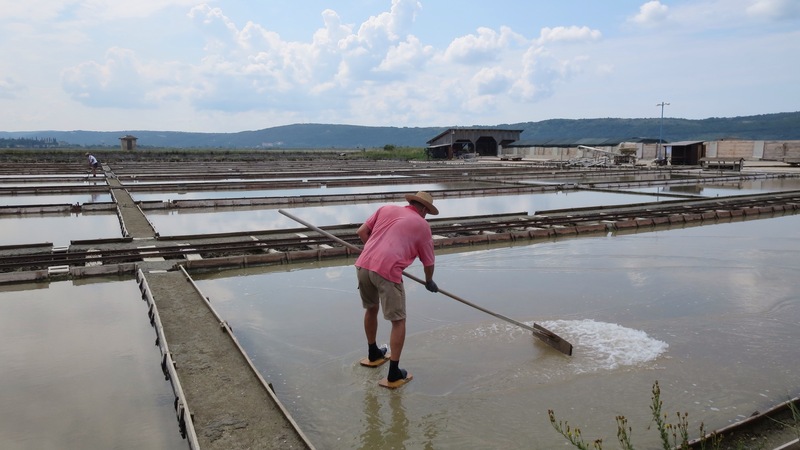 We started with a visit to Piranske soline, or Piran salt flats. Do you use sea salt in your cooking? This is the type of place where it is harvested. 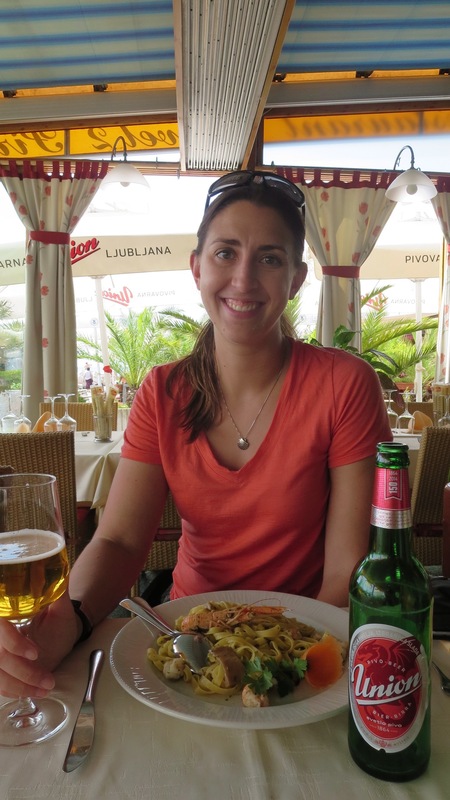 After catching a shuttle into town, we took a break to get some lunch at a restaurant along the water. The water was so gorgeous that I was seriously tempted to run into a shop and buy a swimsuit so I could jump in. With the cold weather that we had been getting in the capital, I hadn’t even considered the possibility of going swimming that day! We explored the streets of the town and climbed up the hill for a panoramic view. 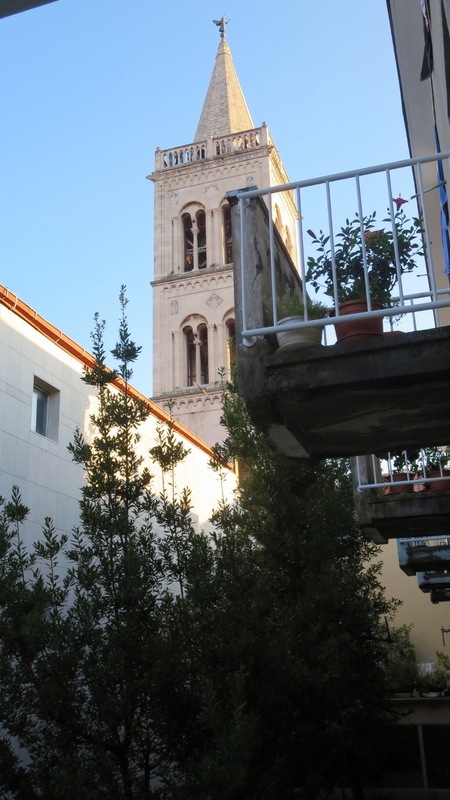 Mom and Grega climbed up the bell tower of the church there while I, um, took a nap in the shade below :). 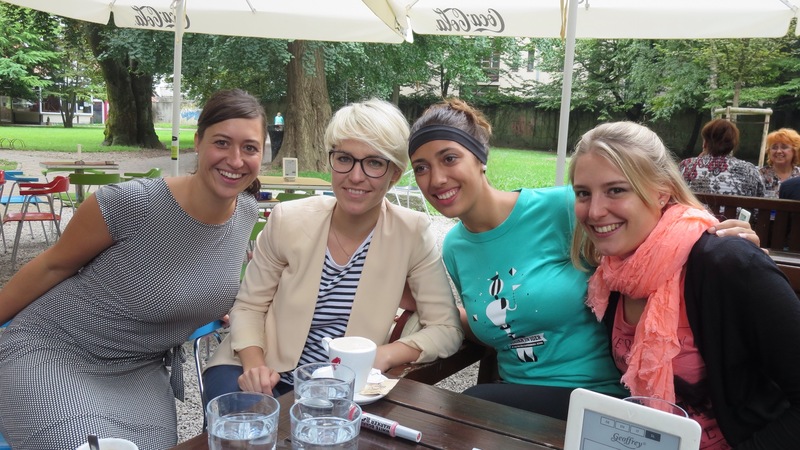 We did some shopping and recovered from the steep walk down with a mandatory coffee break in the square. 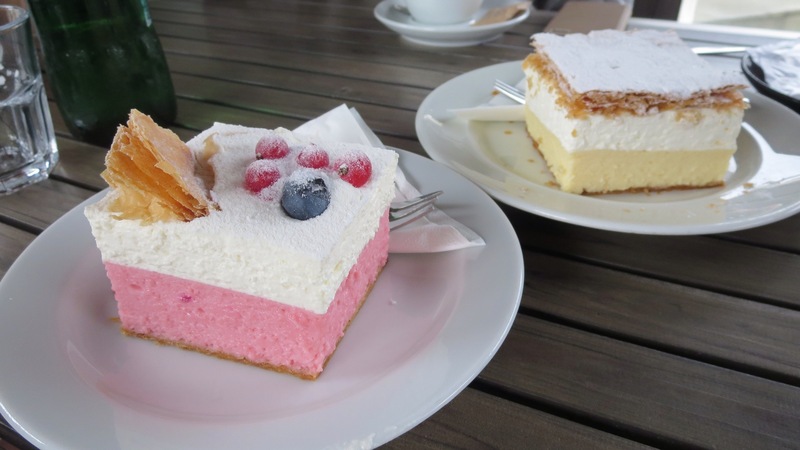 After an additional stop for dessert in Portorož, a nearby coastal town (did I mention that we tend to eat a lot when we go on an izlet?) 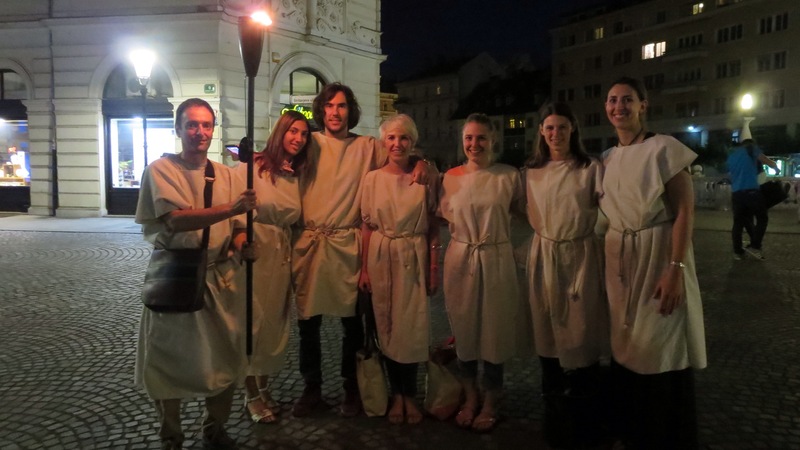 we headed back to Ljubljana. 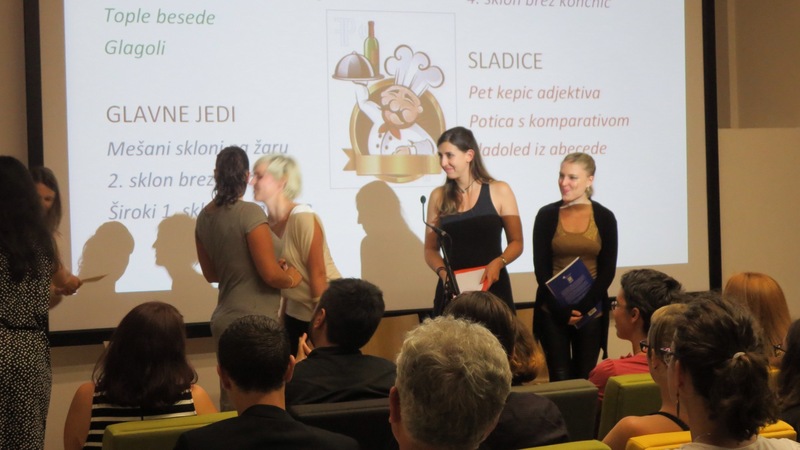 I had signed up for a two-week Slovenian language course during my stay in Ljubljana. I had taken these same courses for one month each during the summers of 2000 and 2001 (ahem, when they cost much less!) but had gotten little to no practice speaking since then. There ain’t a lot of Slovenians in Boston ;). So I anticipated two weeks of trying to refresh my memory. Shockingly, I remembered enough for my placement test and interview to be placed in a higher level class than I would have anticipated. 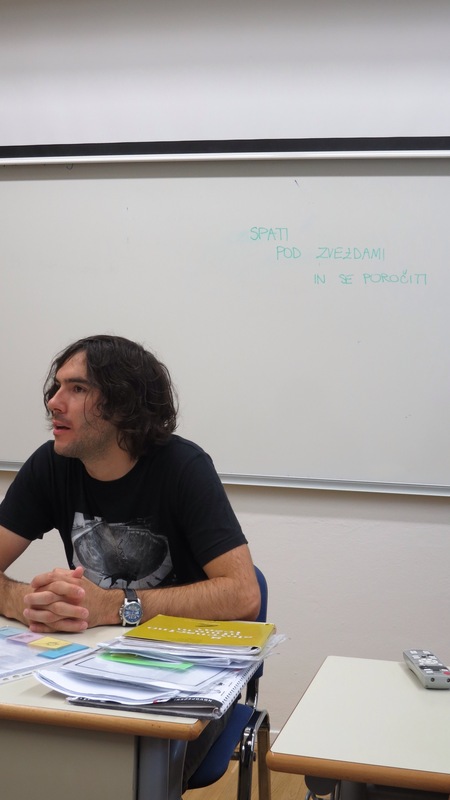 Unfortunately, I spent the first week of classes stuck in Spanish mode, so I spoke in a sad Slov-anish for much of the time, with a few German and Italian terms thrown in for good measure. I found myself answering questions in the affirmative with “Si” or saying things in restaurants like, “Ja, ich moechte ein klobaso, pero no necesito kruha ali senf, thanks. (“Yes, I would like one (German) sausage (Slovenian) but I don’t need (Spanish) bread or (Slovenian) mustard (German), thanks (English)”). My poor brain was so confused. 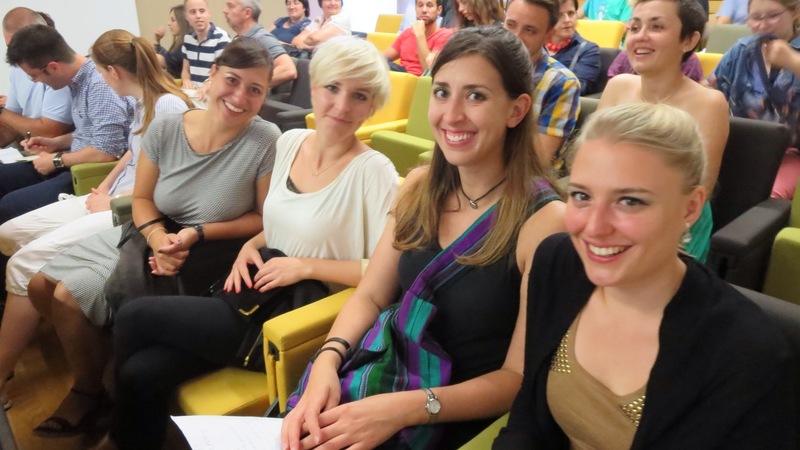 My teacher, Anja, was very understanding, as were my fellow classmates: Melisa, Jennifer, and Maren from Germany; Julien from France; and Anđela from Serbia. 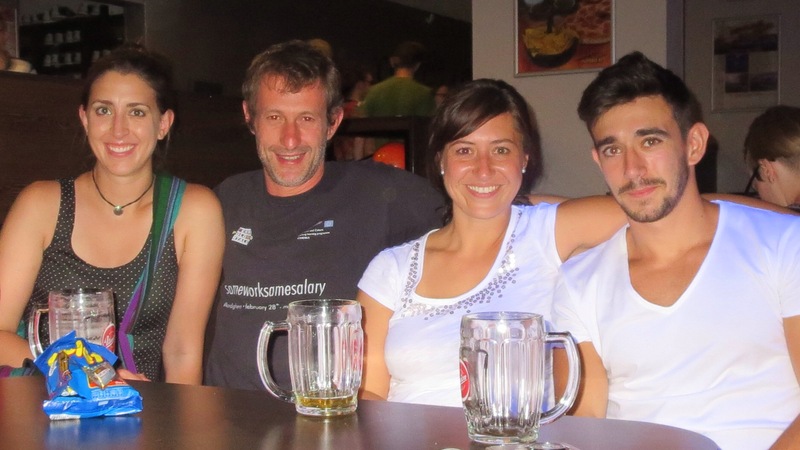 Later in the week, we were joined by Daniela from Germany and Carlos from Italy. We made a good group. 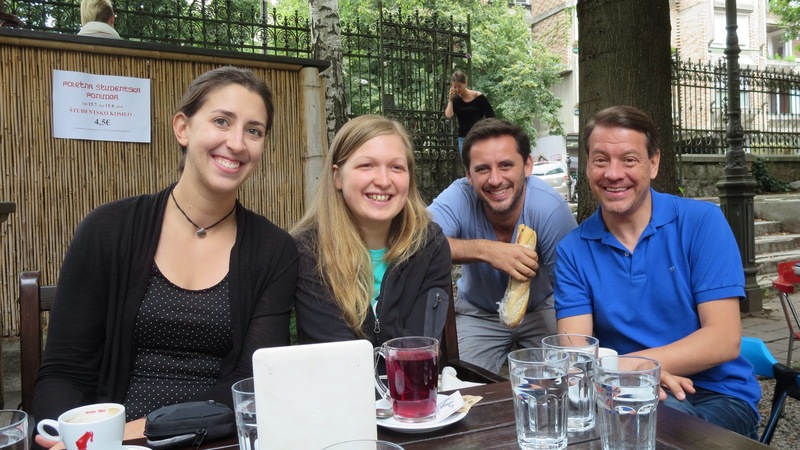 Every day, we had a half-hour break, so we would go to one of two nearby cafes for coffee. 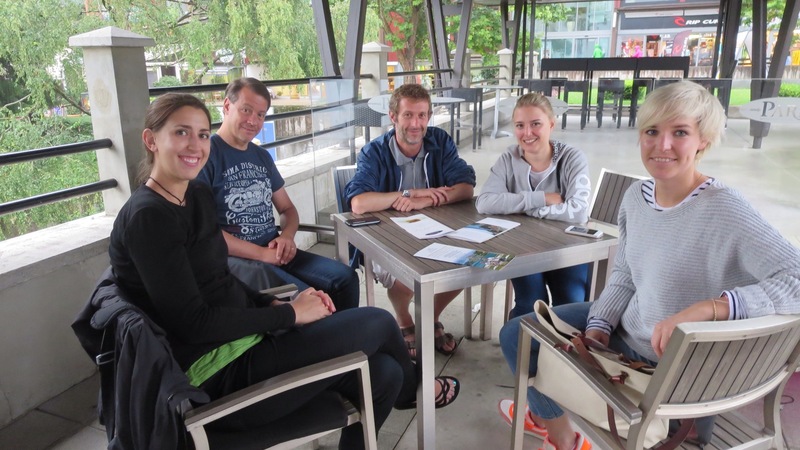 Although the group typically picked a place with an outdoor terrace, I preferred a smaller cafe, Of Moment, because it is owned by my cousin’s friend Aleksandra. 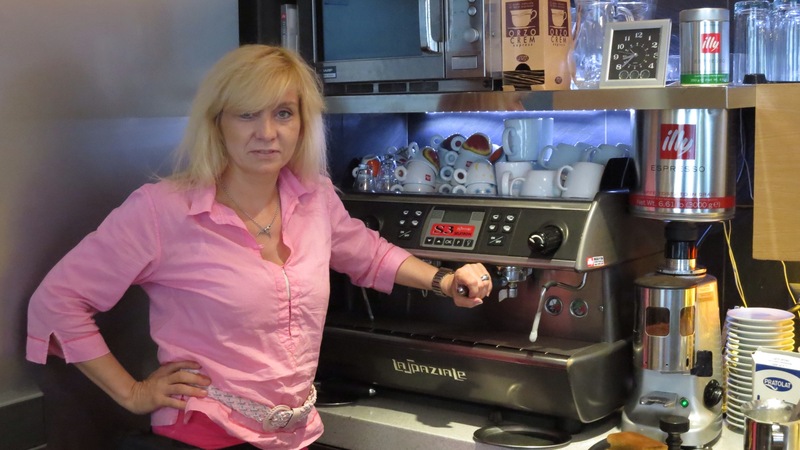 (Talk about word traveling fast: some days I would come home from school and mention to Katja that I had gone for a coffee that morning. She would answer, “I know. I heard.” LOL). Anja would include a lot of learning games in our lessons. 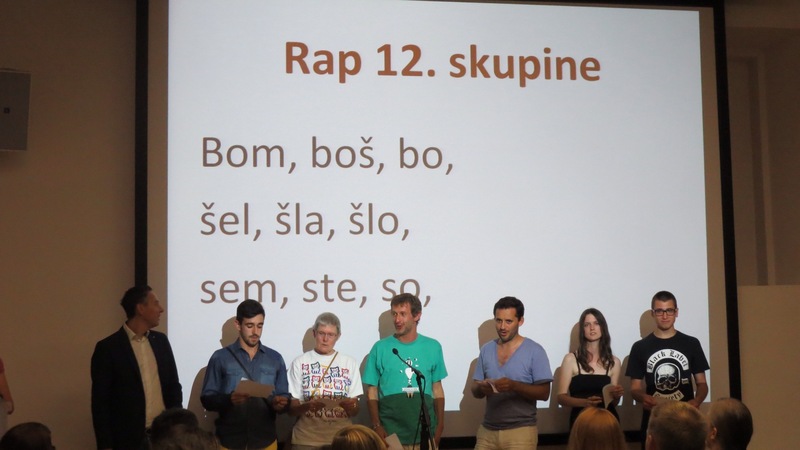 My LEAST favorite (because my vocab is not the greatest) was a game called Vroče Stol, or Hot Seat, where she would write a term on the dry erase board behind you and your classmates would have to describe the word to you (obviously using only Slovenian). I much preferred the trivia game, similar to Jeopardy! I am generally pretty non-confrontational and not competitive about many things, least of all sports. But challenge me to a round of Jeopardy!, and I will destroy you. 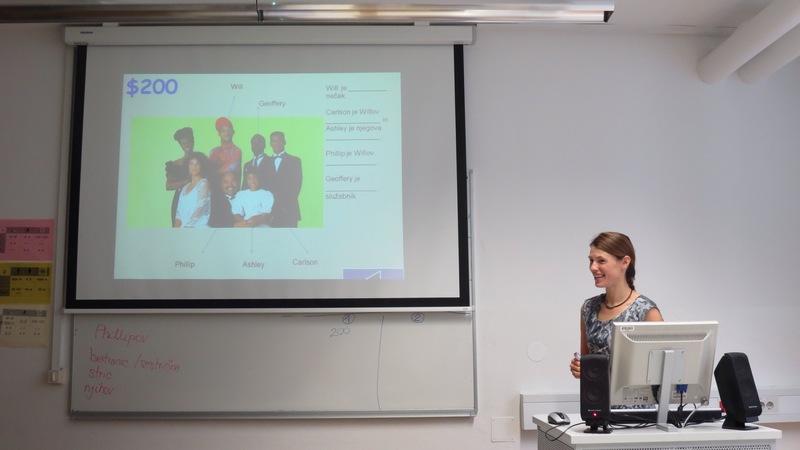 Anja reading a grammar question based on familial relationships on The Fresh Prince of Bel Aire. Guess who answered it? There were also plenty of planned after-school activities. 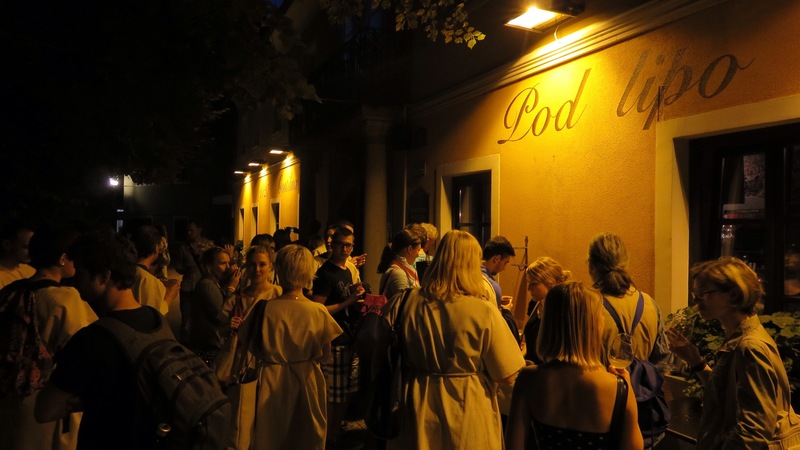 On the first night, the school took a group tour of the ruins of Emona, the Roman settlement which preceded Ljubljana and is celebrating its 2000- year anniversary this year. 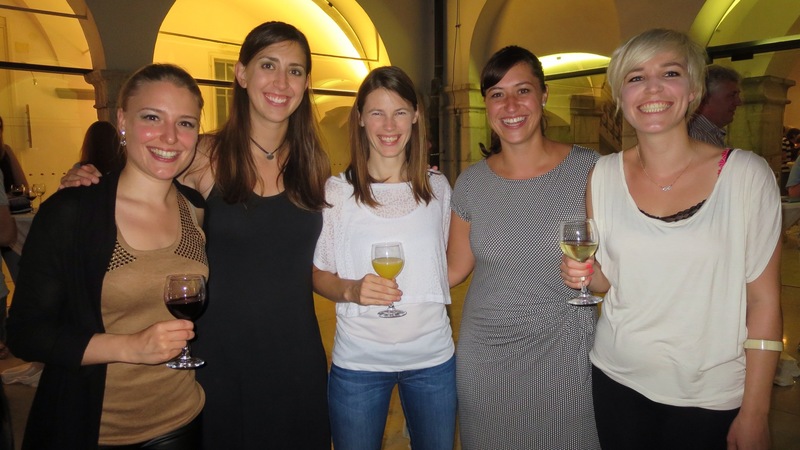 During the tour, we stopped at a pub for typical Roman honeyed wine and stuffed dates. And yes, we wore togas. 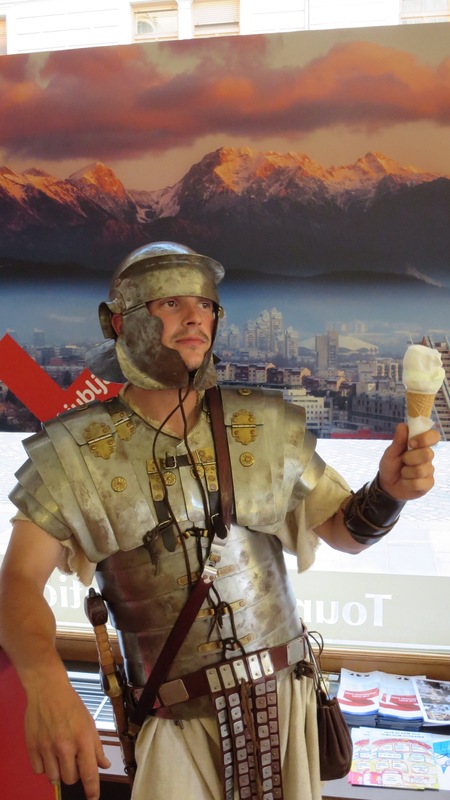 I made this guy hold my ice cream while I put on my toga. He was a good sport. 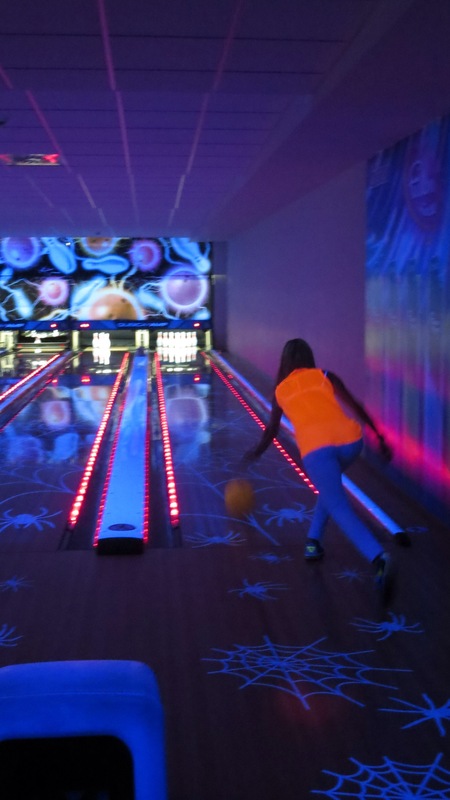 We had a bowling night on Friday evening and went out afterwards. 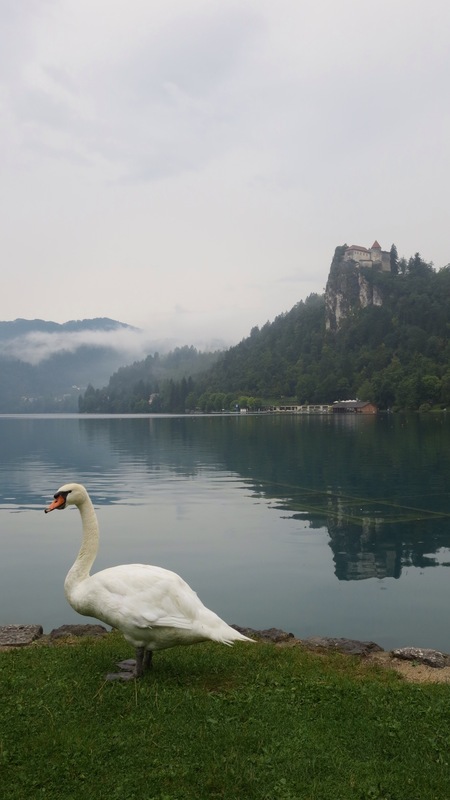 Our class took an afternoon bus trip to Bled but couldn’t enjoy the scenery much due to a torrential downpour that began just after we arrived. 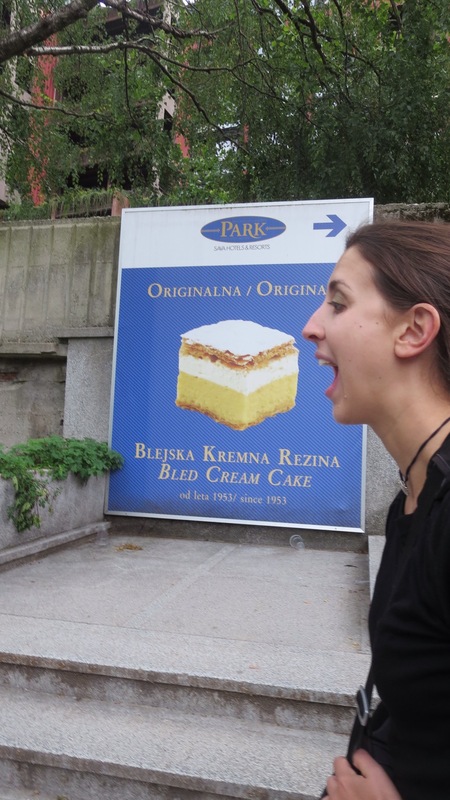 We took this as an opportunity to gorge ourselves on kremšnita and coffee instead. Finally, we had our graduation ceremony. This was fun because my mother could actually come to see it! Every class put on a skit or presentation of some kind. Our group was down to 50% due to early classmate departures, but we made it work. 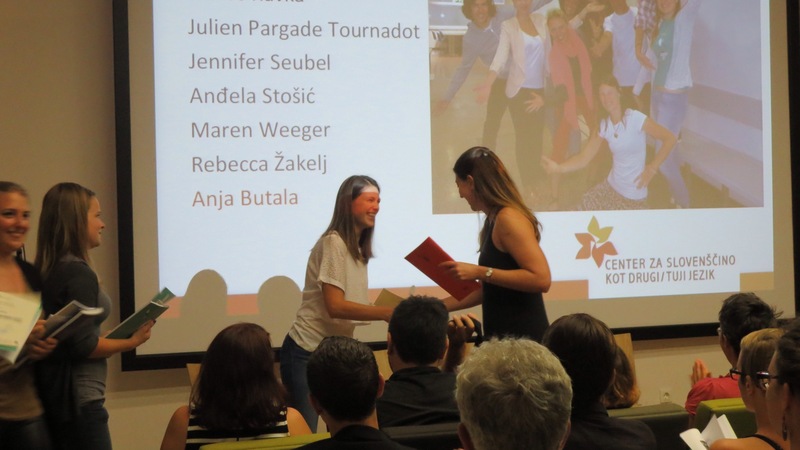 We each received a diploma, and then it was time to celebrate.